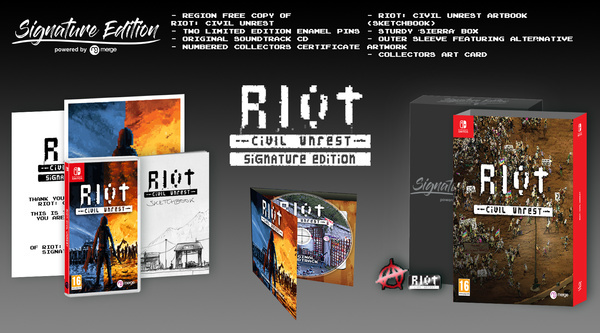 If you've ever wanted to simulate a riot, you'll soon be able to when publisher Merge Games releases Riot: Civil Unrest on the Nintendo Switch next February. The title will be taking to the streets with a full physical Signature Edition release for $44.99 / €44.99 / £39.99. This will particular version will contain a region-free copy of the game, two pin badges, an original soundtrack CD, a numbered Signature Edition certificate, a collector's art card, artbook and strong case with an outer sleeve featuring alternative artwork. You can pre-order it right now. Leonard Menchiari, experienced rioting first-hand at the NoTAV protests in Italy. He created the game to tell the stories and express the feelings experienced during these clashes. What triggers the crowd to behave with such anger and aggression? Often outnumbered, what does a police officer feel like during the conflict? RIOT – Civil Unrest presents the player with the opportunity to experience both sides of the fight - a fight in which there really are no winners. Who is right and who is wrong? Experience RIOT – Civil Unrest and draw your own conclusions. According to the Signature game page, you can take control of the police or the rioters across more than 30 civil disturbances that remain politically neutral to encourage players to make up their own minds about the cause and effects of each encounter. There are four campaigns and a two-to-four player verse mode as well. Take a look at the trailer above and tell us if you would play this game whenever it does arrive at some point in February. Very topical. I can't imagine revealing this now was a coincidence. They should give out more info though. 45 € is a steep price for a indie pixel romp. @ClockworkMario So you think they waited until the yellow vest movement started or what? I like the idea, but the trailer shows absolutely no gameplay so the actual game itself is a mystery. The details in the pixel work looks magnificent though! It makes me wonder, that there isn't already an Youtube / Social-Network-Hater-Simulation. Would be funny to play a game, where you need to hate and downvote on things as much as you can. But joke aside, it really looks interesting. Damn, this looks great. Nice take on rts. This looks very interesting. It received mixed revews on Steam though, it's supposed to be very buggy and tricky to control but those are early access reviews so it should arrive on Switch in a better state. It only costs $12.99 there as well,hopefully the digital version costs around the same. I'm pretty sure there's an enormous economic collapse coming in the next few years, one that will make 2008 look like lost pocket money. I imagine scenes like those portrayed in the game and currently happening in Paris will become common place around the world. I wouldn't buy a game where they can't even get their marketing blurb right. Completely forgot about this. I remember it being announced a few years back. Will have to check it out. @TheLightningYu I think there was a game (possibly even called Social Justice Warriors) which was about arguing about politics on the internet. With multiple character classes and such. The funniest thing about it was that they deliberately made the SJWs and the trolls look exactly the same. It´s a strategy game where you control units in demonstrations and riots. Like you control armies in army based strategy games. You can find some video's of actual gameplay (early access, PC) on Youtube. Given that it's a very interesting topic, and my own experiences with (smaller) police clashes and police presence at peaceful (and/or counter-) protests, it's a game I really want to experience. Already ordered it. The art style is phenomenal. I might buy this for the graphics alone. Pre-Ordered this volume will cancel Amazon.